Montana Bunkhouses Working Ranch Vacations, (this 'ain't no dude ranch'!) attract guests interested in first hand cattle ranching experiences, western traditions, history and heritage. We only invite one group at a time and often you and your companions will be the only guests at the ranch. Twenty Montana ranch families work cooperatively to host guests. Montana! A place where myth has long been in partnership with reality. Here the spirit is rich in tradition and hearty in hospitality. For generations, Montana ranch families' lives have been tied by birth and choice to a part of America that might just prove to be the Last Best Place. Now we invite guests to share our way of life. Montana ranch families are working together to provide guests with a unique Montana Ranch Vacation. If you are looking for a Montana working cattle ranch experience with the opportunity to meet and get acquainted with authentic Montana 4th and 5th generation ranch families--this is it! We are located in dramatic landscapes throughout Montana from Yellowstone National Park to Glacier National Park in high wide and handsome cattle country. 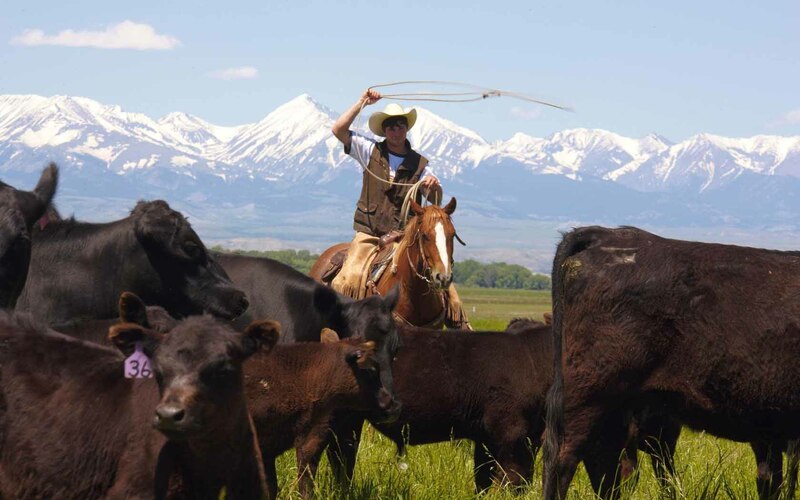 Montana Bunkhouses Working Ranch Vacations LLC offers guests hands-on ranching experiences. One of the greatest things about our way of life is the interconnectedness of the ranching community-the way neighboring ranches help each other during a branding or a cattle roundup and then come together to celebrate at a rodeo and special events. We look forward to introducing you to our friends and neighbors. We are more than a guest ranch, more than horseback riding; we are ranch families working cooperatively, inviting you to join us for a vacation you'll not soon forget. Do as much or as little as you choose while living the Old West Montana ranch experience. Ranch activities vary by the season and include everything from cattle drives with the cowboys to riding the ditches with the irrigator. There is calving and lambing in the spring and horseback riding, fishing, bird watching, hiking and photography in every season. Those seeking adventure may sign up for an authentic cattle drive, trail rides or a pack trip. Others may choose to ride in the pickup visiting with the rancher on daily rounds to feed and care for livestock. While ranchers do not always take the time to go fishing, we know where the best fishing streams are and if you enjoy world class fishing, let us point you to some of the finest trout waters in Montana located right out our back door. You always have the option of reading a book in the shade of the tree next to a babbling brook, going on a nature hike, or having another cup of coffee at the ranch house. Contact karen@montanabunkhouses.com or phone 406.222.6101 and make plans to come as a guest and leave as a friend! Ranch vacation rates vary by the ranch from $200 - $275 per person per day and family rates are available. Lodging, meals and seasonal ranch activities are included in the rate. Don't be confused by all the options, just call Karen, she knows what each ranch has to offer and she will help you find the ranch vacation that suits your interests and fits your budget. 'Experience the traditions' Our goal is two fold: To match you with a ranch that will give you the experience of Montana working ranch traditions. To help keep the Montana ranch heritage alive by creating supplemental agricultural income for generational ranch families. Families who want to pass their ranch down to the next generation are under increasing economic pressure to sell out. We came up with the idea for an agri-tourism cooperative modeled after the European Farm Holiday program. We now open our doors and share our way of life with small numbers of guests who want an up close and personal Montana cattle ranch experience. Schedules are flexible with the right combination of ranch activities, cultural experiences, horseback riding, free time and relaxation. Think of Karen as a native Montanan and a travel coordinator who is skilled as a matchmaker.Let her know your interests. She can put you in touch with ranchers whose Montana roots date back 100 years. If you are looking for a hands-on working ranch that is old-time, real and authentic, and an opportunity to share our way of life, then Montana Bunkhouses Working Ranch Vacations are for you!